This picture show a nice use of space with a nice compliment between deck, pool, equipment, plantings and dog space. Also featured is a slightly raised spa and pool wall with a couple of water features known as cascades.Americans are looking to their backyards as a respite from a hectic world – a place to entertain, exercise and enjoy family and friends. Leslie Licano, representative of industry leader, California Pools, reveals the following roundup of the hottest pool and backyard design trends for 2007. In cities across the U.S., residential lot sizes are getting smaller and homes are getting bigger – this translates to less backyard space – and smaller pools. Shallow pools ranging from 3 to 5 feet deep are a big trend for 2007. According to the Association of Pool & Spa Professionals (APSP), about half of the new pools being built today, are in the small category. Perfect for the space-challenged yard, these shallow pools are ideal for swimming, socializing and playing, and they offer added safety for newer swimmers. Whether for injury rehabilitation or health and fitness, underwater exercise provides an ideal environment for low-impact training – especially in the growing market of aging baby boomers with increasing health challenges. Pool builders are seeing a trend toward the incorporation and installation of sports and fitness equipment in residential pool design. Poolside basketball hoops, built-in volleyball nets, resistance bars and swim harnesses have become the norm, and many homeowners are tapping pool builders to install newer technologies such as swim currents, and underwater treadmills. This picture shows a shallow pool with a large reef shelf entry. The first step into pool is a large shelf where family and friends can gather and it’s great to just lounge and sun bathe. 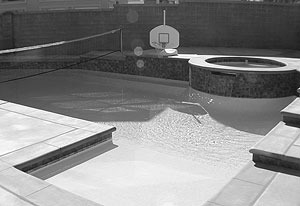 We have provided anchors in the deck that are utilized to support the volleyball net and the basketball hoop.POOL DESIGN GOES 3-D.
Due largely to the vast array of design media available, today’s informed consumers are more savvy than ever about the backyard design choices they make – sending the standard kidney bean or plain rectangular pool closer and closer to extinction. With new 3-D design tools, homeowners can try on their exotic pool designs before ground is even broken by taking a 360-degree tour of their yard, landscaped complete with different materials, finishes and features. Buyers receive added peace-of-mind and design control as they ‘virtually’ fly over, swim in and walk around their pool, while it’s still in the easily manipulated conceptual design stages. Technological advances such as automated cleaners, salt-water sanitation and in-floor built in cleaning systems with remote control convenience. Energy-efficient, green technologies, standard installs in today’s pools.